If you have had one or more symptoms of pregnancy, you are probably anxious to confirm your suspicions. Now is the time to take a home pregnancy test, HPT. The tests are extremely easy, inexpensive, and all you need is a restroom where the test can be performed. You can find a number of different types of home pregnancy test, each producing the same result, although the method may differ. You can purchase home pregnancy test kits from your local pharmacy or order one online. 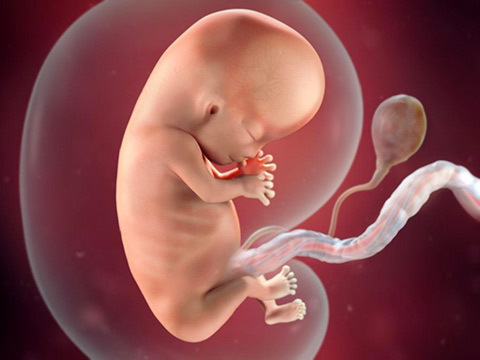 About a week after the woman’s egg is fertilized in the fallopian tube, it travels down to the uterus, where it burrows in and starts releasing hCG (Human chorionic gonadotropin), the pregnancy hormone. 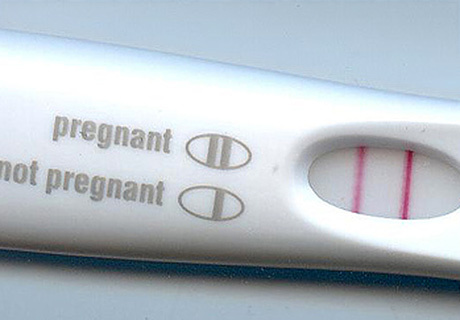 Pregnancy tests generally measure the hCG – which is unique to pregnancy – in the urine or blood. These tests are getting more and more sensitive and can turn positive as early as one week from conception. There are several varieties of pregnancy tests. Some are used in home testing and some are done in a lab. Some tests are done on urine and some on blood. 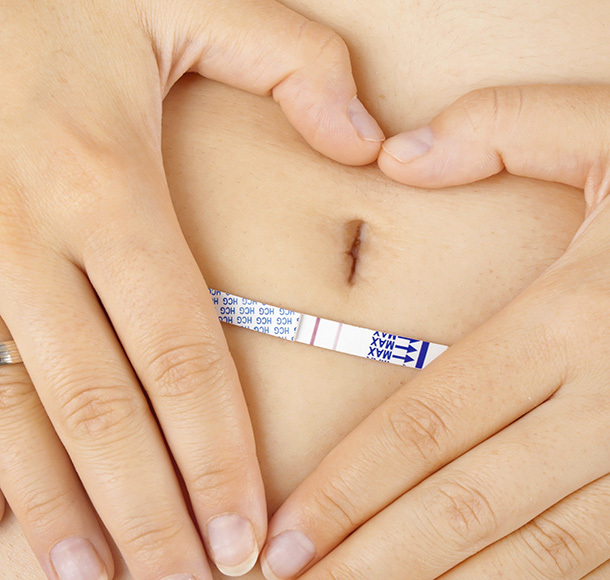 All of the commercially available tests detect hCG, a glycoprotein composed of 237 amino acids. This substance is produced upon implantation of the fertilized ovum. A sensitive blood or urine test detects this substance as early as eight to nine days after ovulation. The plasma concentration of hCG doubles at least every 2 days, peaks between days 60 and 70 of pregnancy and then declines. A commonly used, simple clinical test recognizes hCG by using an antibody to the hCG molecule. This antibody is placed in contact with the specimen, and if it does not contain hCG, a reaction occurs, often agglutination (clumping). If it does contain hCG, no agglutination occurs. Another type of test is called the enzyme-linked immunosorbent assay, which is extremely sensitive – to 50 mIU per ml. This uses a technique where antibody (bound to plastic) binds up the hCG in the specimen. A second enzyme-laden antibody is added to “sandwich” the hCG and reacts with a color intensity, depending on the amount of hCG in the specimen. In the home tests, you use a wick, which is in contact with a membrane containing antibodies to human chorionic gonadotropin (hCG). Colored particles of latex, which are sensitive to antibodies to hCG, form one layer of the membrane. If the urine contains hCG, it will react with the antibody on the latex, and a colored line will form. Home pregnancy tests, if done exactly according to instructions, claim 97 percent accuracy, but several studies have found that there was a large percentage of false negatives and a significant (though smaller) number of false positives. This was mostly due to poor technique or doing the test too soon following conception. Blood test can give an accurate reading of your hCG level. Does a faint line still mean positive? The short answer is a qualified yes. A faint line usually means that you’re pregnant. The woman is so recently pregnant that her hCG can barely be registered in her urine. Her pregnancy is further along, but she only releases a small amount of hCG. In the first case, a common mistake women make is to take the home pregnancy test too early. Pregnancy tests are only accurate if they test at the right time! Testing needs to be done at least 10 days (and often longer) after fertilization. Many women make the mistake of assuming that they ovulated on that magical Day 14, and thus test by about Day 24. In reality, they may not have ovulated until Day 30, in which case testing through a home pregnancy test would be totally useless, until at least Day 40. If a pregnancy test is “wrong”, it is more often a false negative rather than a false positive. In other words, it is quite common for a pregnancy test to appear negative, leading the woman to believe she is not pregnant, when in reality, she just tested too soon. Testing even a few days later will often reveal a positive. But it is imperative that she test at least ten days after fertilization, hence the value of women charting their fertility signs to know when they’ve ovulated. But it is very rare to have a pregnancy test show that the woman is pregnant when she really is not.